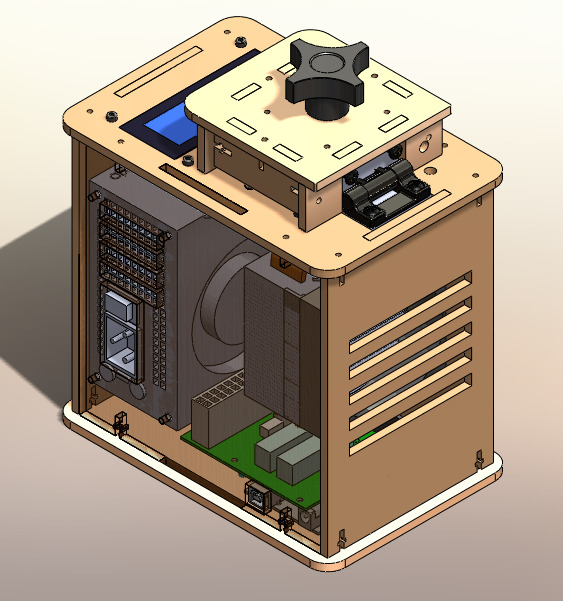 This is a solidworks rendering of the OpenPCR machine. The OpenPCR is an affordable alternative to costly clinical machines used to amplify particular DNA sequences. This interfaces with any computer with the proper software downloaded and the process of thermal cycling to conduct a variety of tests. This could be anything from paternity tests to test for genetic markings of cancer. When we unplugged the display (part 3) from the power supply (part 6), the machine did not have power. The blue display screen did not turn on and appeared completely black. When we unplugged the white wire that connects the power supply (part 6) to the heat block (part 2), the machine temperature on the display screen appeared incorrectly. 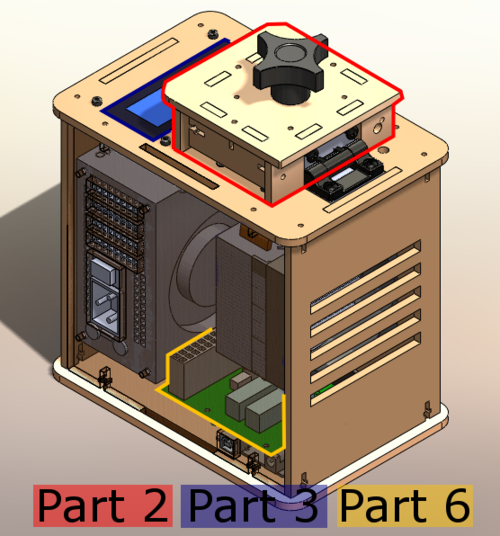 Part 6 is responsible for recording the the internal temperature of the machine throughout the test. Our first Open PCR test was conducted on Wednesday, October 24, 2012 on machine number 7. While running our open PCR test, we experienced nothing but problems. We set the cycles to the appropriate temperatures and time intervals; the Initial cycle on 95°C for 30 seconds, the Denaturing cycle on 95°C for 30 seconds, the Annealing cycle on 55°C for 30 seconds, the Extending cycle on 72°C for 30 seconds, the final cycle on 72°C for 180 seconds, and the final hold at 20°C. Initially, our open PCR appeared to be running correctly for the desired two hour time interval. However, due to a cycling error, our timer extended to nearly three hours. Not only did our test exceed the desired time interval, but our time would not wind down. Our test constantly moved up and down between the times of two hours thirty minutes and two hours and fifty minutes. When our time got close to two thirty, more time would be added to our test. Also, our laptop was experiencing errors. Our laptop received an application error notice multiple times, each time disrupting our process. As a result of these complications, when the two hours elapsed we only reached step seventeen of thirty. We were forced to prematurely end our test. Therefore, we could not receive sufficient results. One way to improve on the quality and production of the Open PCR machine is to maximize the number of loading wells and shorten the cycle time. The Open PCR machine takes too long to test only 16 samples of DNA. Also, the latch to get to the loading wells served as a hassle. It was tough to open while being careful with the expensive machine at the same time. If you are using the Open PCR as a learning tool, as we have, the machine should be transparent or constructed to be easily disassembled so students can get a better view of the job and responsibility each part completes. However, the machine is constructed with some positive qualities. The machine is affordable, and it is light weight and compact making it easily transportable. The bright glowing screen can easily be read, and the test runs very quietly. While the machine is testing, no extra work needs to be done. It is very easy to start the test and patiently wait for it to end. Within a polymerase chain reaction everything is controlled by temperature. The high temperature(95 C) causes melting of DNA templates and primers by disrupting the hydrogen bonds. Next is annealing. The temperature is dropped down to 65 temporarily(20 seconds) to allow a piece of DNA to bind to your product from the initial step. The polymerase binds to the DNA template and DNA synthesis begins. Next is elongation, the DNA polymerase synthesizes a new DNA strand. This process is repeated to replicate numerous strands of DNA. a. Then you lower the temperature to 65 which allows a piece of the DNA to bind to the initial step product. b. 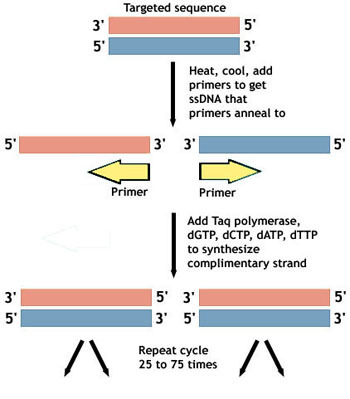 Each strand of DNA molecule becomes annealed with an oligonucleotide primer complementary to either end of the target sequence. 1. Remove all contents from the black box. 2. After removing the lid, flip the box upside down. 3. One side of the box will detach. Fold this side up and create a cave like opening (as seen above). 4. Place the Fluorometer device within the upside down box. 5. 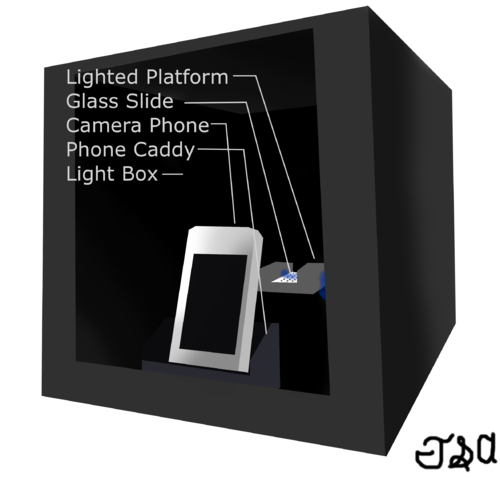 Lastly, place the smartphone in the black stand with the camera facing into the box. 1. Obtain a computer and install the ImageJ software. 2. After taking the pictures needed, connect the smartphone to the computer with a USB cable. 3. Once connected, open the folder containing the smartphone (found in My Computer or Devices). 4. Create a folder on the desktop (this will be used to temporarily store the pictures). 5. Copy and paste the pictures form the smartphone folder (DCIM) to the desktop one. 6. Open the ImageJ software and click File and the Open. 7. From this Open menu, select the preferred picture from the folder on the desktop containing the pictures. PCR produces amplification in the presence of cancer SNP by creating around 100 billion copies of certain sequences found in the DNA. This process can take only a couple hours. During the process, Primers are added to the extracted DNA, where it attaches to the ends of specific DNA segments. Nucleotides are added so that they can create new copies of the DNA. Finally, DNA polymerase is added and works to make new DNA copies by attaching matching nucleotides. With increased temperatures, the double helix of the target sequence separates. Primers attach onto targeted regions on the separated strands and the polymerase attaches free floating nucleotides on the new strands. The process of separating and reattaching of the targeted sequence is repeated and in the end, around a billion of DNA present will be those of the DNA segments that has been targeted and contains the SNP. The gene we are looking at is rs17879961 (CHEK2 gene), a gene that indicates susceptibility to breast and colorectal cancer. It is located on chromosome 22 and codes for a cell-cycle regulatory kinase responsible for DNA repair processes in BRCA1, a gene that is responsible for breast cancer. This is a change from an ATT codon to an ACT, a switch from isoleucine to threonine. -Bayes Explanation Due to the occurrence of false positives and negatives during testing, not all tests are suitable for a wide-distribution. To enumerate the validity of such tests, Bayes Rule is commonly utilized. Bayes Rule relates the probability of accurate positive and negative results to those of false positive and negative results to determine whether the test is reliable. Sample = Sample denotes the sample of DNA used in a given trial. Each sample represents one extraction of DNA from one of two patients. The multiple trials per patient guarantee accurate results that a single trial could not, for example false positives and false negatives can impact the results and multiple trials will somewhat eliminate the error of one trial. Integrated Density = Integrated density is the sum of the values of the pixels in a given area, which is equivalent to the product of the area of the selection and the mean gray value. DNA μg/mL = To calculate the concentration of DNA, we created a calibration curve using the given concentrations of DNA for the negative and positive control samples - 0 μg/mL and 2 μg/mL, respectively. This yielded the equation y = (X-267793)/(13571087.5) where y = the concentration of DNA in μg/mL and X = the integrated density for a given sample. This page was last edited on 14 November 2012, at 09:30.